Rider Time: Kamen Rider Ryuki is a 3 part spin-off of Kamen Rider Zi-O and serves as a sequel to Kamen Rider Ryuki. 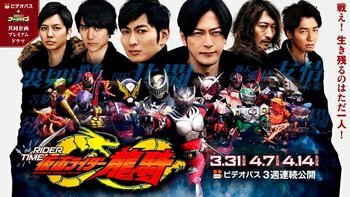 The Bus Came Back: Ren Akiyama, Goro Yura, Jun Shibaura, and Miyuki Tezuka all return for the first time since Ryuki. Takeshi Asakura makes his return after Ex-Aid's Kamen Rider Brave: ~Let's Survive! Revival of the Beast Rider Squad!~ special. Canon Immigrant: Kamen Rider Abyss appears alongside the original Ryuki Riders in the special taking the place of Kamen Rider Femme who was the only female rider of the original 13. Abyss was previously a Rider specific to Kamen Rider Decade. Chuck Cunningham Syndrome: Kamen Rider Femme appears to be the only Rider out of the original 13 to not make a reappearance in this special in any form. Darker and Edgier: Compared to Kamen Rider Zi-O, this spin-off appears to be more in line with the early Heisei era in tone. Laser-Guided Amnesia: When the 13 Riders were brought to Mirror World, they lost all their memories of their lives except their names. Asakura is the only exception, remembering everything even what happened during the original Ryuki. In Alive A Life, Goro is revealed to have retained his memories too, taking vengeance on Ouja at his weakest. Race Against the Clock: This Rider War will only last for a week and by the time the first episode has started, four days have passed. Simultaneous Arcs: While the events in the Mirror World are at-play, Kamen Riders Zi-O and Geiz are dealing with the Another Rider connected to this new battle. There Can Be Only One: Like the original Rider War, only one of the 13 Riders can survive this war. Trapped in Another World: Unlike in the original series, the riders are trapped inside the Mirror World.